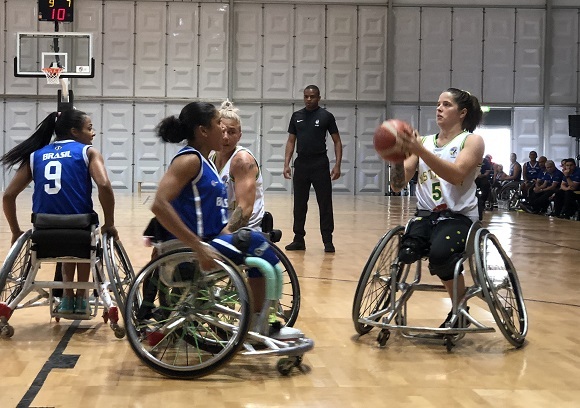 The game provided a real contest for the Gliders and while they looked to be sitting pretty with a double-digit lead late in the third quarter, Brazil made them work for the victory right until the final siren. They trimmed a 13-point deficit with a three-pointer on the three-quarter time buzzer and then continued to come at the Gliders in the fourth term, truly making the Aussies work for the win. Australia still led by seven with less than a minute remaining and looked to have held their opponents at bay thanks to a Georgia Munro-Cook free-throw but Brazil kept coming and made it a two-point game on the final possession. The Gliders then turned it over on an errant inbound pass but hustled back to put Andreia Farias off the game-tying attempt and from there, Australia was able to control the ball to claim the 55-53 victory. The contest started off slowly for both teams with fatigue potentially playing a factor in their last game of the tournament. Missing a couple of easy shots, the Gliders gave Brazil some breathing room but the Brazilians were still struggling to penetrate Australia's defence and the efforts at that end of the court began to pay dividends for the Gliders. Shelley Cronau's delivery saw her tally seven assists and her court vision set up the likes of Munro-Cook and Amber Merritt (four points, six boards). The Aussies started the second term with a 7-2 run to pull themselves into the contest and Cobi Crispin (14 points, ten rebounds, four assists) then made her impact felt on the scoreboard and the glass. Shelley Chaplin (five points, four assists) came off the bench to maintain the pressure and her efforts helped give the Gliders a six-point lead at half-time. Australia then truly found their shooting stroke in the third, breaking down Brazil's defences to feed the ball down low to the likes of Munro-Cook (a team-high 18 points) and Annabelle Lindsay (eight points, four rebounds) while Hannah Dodd was also able to join in on the act. The Gliders shot 8-16 from the field and looked to be in control although a three-point buzzer-beater from Brazil gave them a spark to keep the game tight until the final siren.